A class for reading and writing compressed data onto a device (e.g. file, but other usages are possible, like a buffer or a socket). Use this class to read/write compressed files. Definition at line 40 of file kcompressiondevice.h. Constructs a KCompressionDevice for a given CompressionType (e.g. type the CompressionType to use. 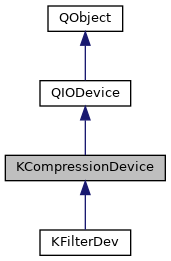 Definition at line 109 of file kcompressiondevice.cpp. fileName the name of the file to filter. Definition at line 120 of file kcompressiondevice.cpp. Calls close() if the filter device is still open. Definition at line 133 of file kcompressiondevice.cpp. Close after reading or writing. Definition at line 182 of file kcompressiondevice.cpp. The compression actually used by this device. If the support for the compression requested in the constructor is not available, then the device will use None. Definition at line 142 of file kcompressiondevice.cpp. Returns the error code from the last failing operation. This is especially useful after calling close(), which unfortunately returns void (see https://bugreports.qt.io/browse/QTBUG-70033), to see if the flushing done by close was able to write all the data to disk. Definition at line 204 of file kcompressiondevice.cpp. Call this to create the appropriate filter for the CompressionType named type. Definition at line 86 of file kcompressiondevice.cpp. Open for reading or writing. Definition at line 147 of file kcompressiondevice.cpp. That one can be quite slow, when going back. Definition at line 209 of file kcompressiondevice.cpp. For writing gzip compressed files only: set the name of the original file, to be used in the gzip header. Definition at line 426 of file kcompressiondevice.cpp. Call this let this device skip the gzip headers when reading/writing. This way KCompressionDevice (with gzip filter) can be used as a direct wrapper around zlib - this is used by KZip. Definition at line 431 of file kcompressiondevice.cpp.